Rainy or cold or blistering hot days with toddlers can be . . . challenging. They want to go outside and play, and you would love to send them outside to get that energy out, but the weather is just not cooperating. The kids feel stuck inside and it’s not long before you are all starting to get a little stir crazy. Believe me, I feel you. I totally get it. I live in a part of Texas that gets a lot of rain and it can be very frustrating for a mom of littles. Don’t lose hope, mama! I am here with a list of five great ways you can keep your kiddos entertained indoors when the rain just won’t go away. This one is the easiest way to keep toddlers entertained! Throw a bed sheet over your kitchen or dining room table, arrange some blankets and pillows under the table, and stock the space with books, flashlights, coloring books and crayons. Congratulations, you are now the coolest mom ever. 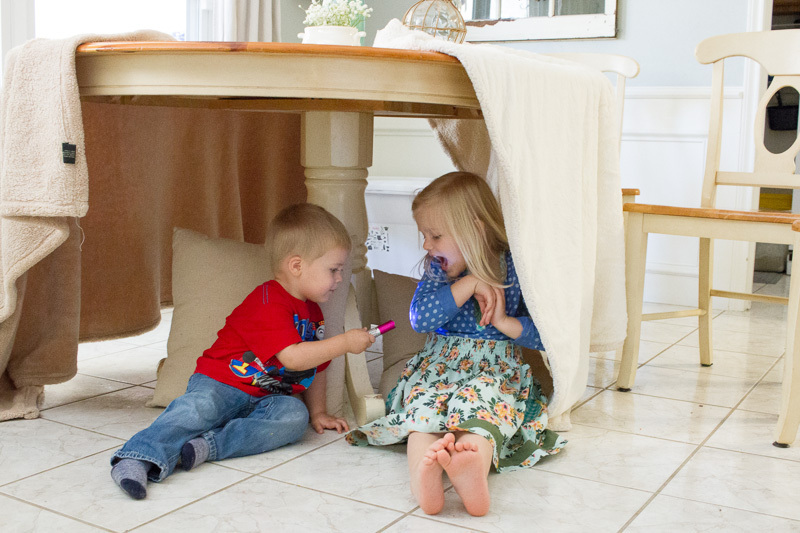 Kids LOVE forts and they are likely to play in one for a good period of time. I like to set up a fort around lunch time on rainy days and let them have a “picnic.” They love it, I love it–win win! Kids love to get messy (can I get an amen?). There are two ways I have found that allows kids to explore their artistic side while still containing the mess to a minimum cleanup for me. First is to hang up a large piece of brown kraft paper on a wall using painter’s tape. Put a tarp or a sheet on the floor beneath the kraft paper. Set out a few plastic cups full of washable kids finger paint and let them create a mural. The second way is to set up your finger paints in the bathtub and let the kiddos go to town “decorating” the tiles. 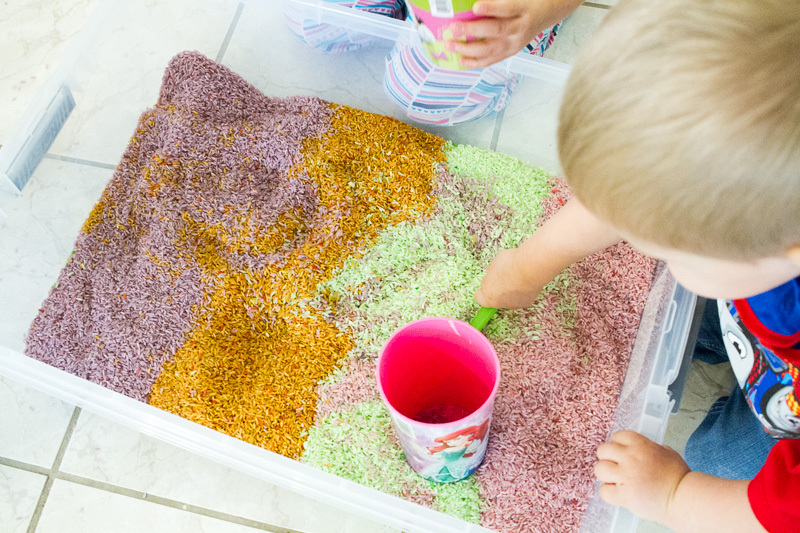 It’s a fun way to let them get messy and creative without creating a whole lot of cleanup work on your part. Hot glue a couple of paint sticks to the back of some heavy duty paper plates. Teach your kids to hit the balloon back and forth to each other and challenge them not to let it touch the floor. Cut out colorful fish shapes from felt. Hot glue two fish shapes together with a small washer sandwiched between them. Tie a length of yarn to a wooden dowel rod. Tie or glue a small magnet to the other end of the length of yarn. Empty the glue into your bowl, then fill the glue bottle with water, shake, and dump into the bowl. Add your food coloring and glitter and mix well. Set aside. Put 1/4 cup warm water into your plastic cup and add the Borax, mixing until the Borax dissolves. Pour Borax mixture into the glue bowl and start mixing. When it gets too hard to stir by hand, start mixing and kneading with your hands until the mixture becomes pliable. Store in a small Tupperware container. Put about 5 cups of rice in each plastic bag. Add 2-3 tbsp white vinegar and 30-40 drops of food coloring to each bag. Seal each bag and shake it up until all the food coloring is easily distributed. Open the bags and allow them to air dry overnight (reduces the vinegar smell). Pour each bag into the large bin carefully to make a rainbow. When your kids are done playing, snap the lid on the bin and store it away for the next rainy day! When all else fails, if it’s warm enough and there’s no lightening, grab the rain boots and umbrellas and let your kids go jump in some puddles and dance in the rain. Both of my kids think it’s the best thing EVER when they get to play in the rain with their umbrellas. Sure, they may get wet and muddy, but it will give them the opportunity to get outside and get some wiggles out. Just be sure to keep some towels nearby for when it’s time to come back inside! 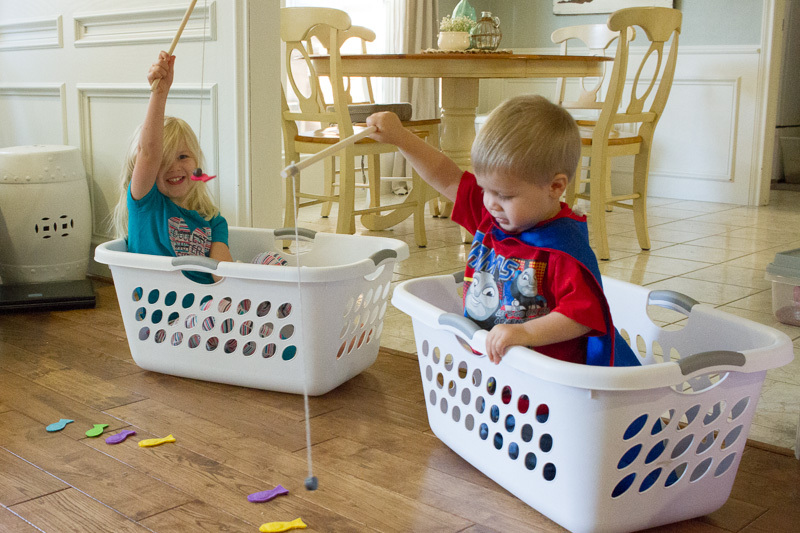 How do you keep your active kids busy on dreary days?